The long awaited update to Tweetie 2 has finally been approved. Version 2.1 of the app has quite the change log and includes both new features and bug fixes (view the entire change log below). The DevTeam has released QuickPwn for firmware 2.1. Please be sure to read the info below that is from the DevTeam’s blog. Click HERE to get the downloads for QuickPwn for firmware 2.1. WinPwn has not yet been released for firmware 2.1. I keep an eye on their website and will let you know as soon as it is. I finally had a chance to sit down and take a look at the new Customize for firmware 2.0. At this time, it is still not available via Cydia and the only way to get it on your iPhone or iPod Touch is to SSH it in Customize is now available via Cydia. 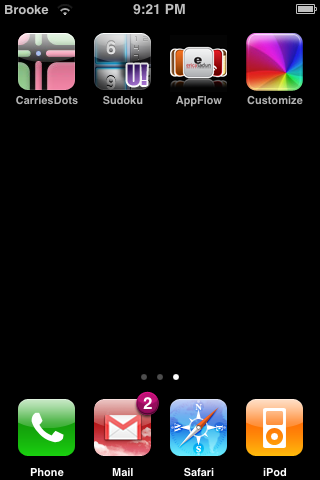 When I SSH’d Customize onto my iPhone, I had to go in and change the permissions of all the folders/files inside the Customize.app folder to 0755. Before I change the permissions the app just opened and closed (I tried to open it quite a few times before I changed the permissions). People have been asking what will happen to jailbreaking when firmware 2.1 is released by Apple (which is currently in beta testing). Well, good news! 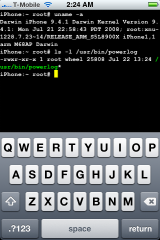 The Dev Team has already successfully jailbroke firmware 2.1 (see screenshot below). So, no worries, jailbreaking will still be available on the new firmware! Now all we need is Installer.